For as long as I can remember, I have been a bedtime reader. I love a good story, sometimes to the detriment of a good night’s rest. So it’s no surprise that my kids read at bedtime, too. It’s a habit we started before they could identify the letters of the alphabet, when I would nestle two, then three, small children onto my lap and read as part of the bedtime routine. Bedtime reading -- even long after you outgrow the cradle! One night last week it struck me – out of the blue, as these parenting things so often do – how much that bedtime routine has changed at our house over the years. 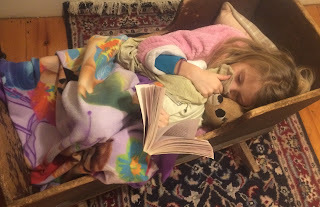 I was tucking in the not-so-little-anymore littlest one when it hit me that she is the only one I still read to on a regular basis – and that soon she’ll probably want to read on her own at bedtime, as her older brother and sister do now. When the kids were little, we would take turns snuggling all together in one bed or another, rotating whose turn it was to choose the book. There were favorites, of course, most memorably Goodnight Moon and The Going to Bed Book. I can still recite large portions of both from memory. As the kids grew – in both stature and story savvy – we moved to the stairs, where I could snuggle one child onto my lap and the other two on either side. We shifted from rhyming picture books to longer stories, then progressed to chapter books. I read the Little House on the Prairie series, a couple of E.B. White classics, and the first two or three Harry Potter books out loud to my children at bedtimes. Gradually, as the older two became stronger independent readers, one or both of them would be too enmeshed in whatever book they were reading on their own to join the family bedtime reading session. I’d often find myself sitting unnecessarily on the stairs with only one child. Now the youngest McPhaul is an independent reader, too. We still read together most nights, she and I, although now we alternate pages: she reads a page to me, I read a page to her. I tuck the other kids in before or after, sharing a few moments – often our only one-on-one time of the day – to hear the news from their day, or to answer kid questions, or to simply appreciate that they still want me to tuck them in. Bedtime is, however, not always peaceful. A morning person by nature, I am often frazzled by then – distracted by the running list of things to do before I get to go to bed myself, thinking of some work challenge or household task, or frustrated by the disarray I find when I step into the kids’ rooms to say goodnight. The littlest one takes the longest to tuck in. She often has reading homework, which she insists on saving until bedtime. After that, there is a whole series of bedtime measures that must be taken: a special song, our secret handshake, and a specific sequence of kisses. This can be both sweet and exhausting. Since my bedtime revelation last week, I am embracing the sweet side of the bedtime routine and trying to let go of the rest. This youngest child and her older sister often tiptoe downstairs – or slide down the banister – to find me long after they’ve been tucked in. They need a drink of water or to pack something in a school bag or to tell me one more thing. Sometimes they’re just after an extra hug. Some nights I hurry them back to bed with a quick squeeze and a firm admonition to go to sleep. But sometimes I linger in that last hug of the night. I notice how tall my children have become and wonder how much longer they’ll come to me for one more post-bedtime cuddle. I know this phase, too, will pass as they grow bigger, more independent, further from those nights of bedtime stories read together. Original content by Meghan McCarthy McPhaul, posted to her blog, Writings From a Full Life. This essay also appears as Meghan's Close to Home column in the March 24, 2017 issue of the Littleton Record. Some of my best and longest-standing friendships are with my childhood ski buddies. So it’s been fun, in that circle-of-life way, to watch my children creating bonds with their own ski pals this winter. Ski buds from way back! Watching these friendships unfold, I’ve pondered what it is about skiing that fosters such close ties. Perhaps it is simply that there is ample time on cold chairlift rides to talk and laugh. Maybe it’s lunchtime in the lodge or cheering each other on at ski races. My sense, though, is that it’s more than that. It’s something about shared experience – the early morning wakeup calls and bundling up against the cold, the days spent outside that both exhaust and exhilarate, the immeasurable sense of joy that comes from flying down a mountain – the things skiers understand simply through embodiment. When I was a kid, my family headed north from our home in Massachusetts to our ski place each Friday night, then repeated the trip in reverse Sunday evening. The drive was about three hours one way. Looking back now, from the perspective of a mom with three kids and all the related logistics, I’m not sure how my parents did it. But I’m awfully glad they did. None of my friends from home skied. There was no school ski program, like the one my own kids participate in now. The local high school didn’t have a ski team. The closest place to ski –the place where I taught ski lessons for a while as a teenager – was a hill smaller than the trail where I learned to turn as a toddler. I didn’t think much about this skiing lifestyle when I was a kid. It was just what we did. And it was what my ski friends and their families did, too, whether they trekked to the mountains from someplace else, as we did, or lived more locally. Every Saturday and Sunday of the season, plus every single day of winter vacations, we were out of the house and headed to the mountain before the sun – if it made an appearance at all – was fully risen over the mountains. At lunch time, we gathered together – a gaggle of kids and their parents – to eat sandwiches, crowded around a few tables in the lodge. On Saturday nights, multiple families congregated at one house or another in an alternating pot luck that lasted the length of ski season. 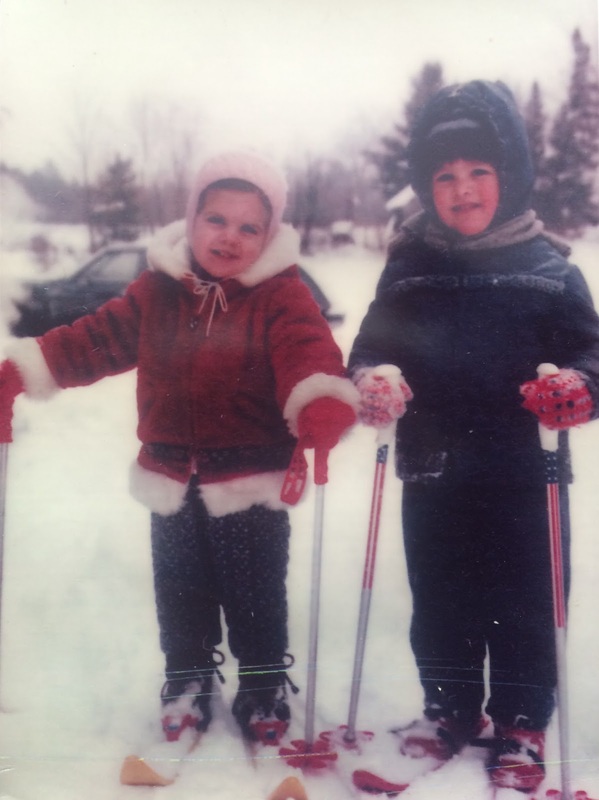 Skiing has certainly been an integral part of my life and my way of living, affecting not only my friendships but the places I have chosen to live, the work I have done, and the way I am raising my family. As I thought about ski buddies – old and new – this week, I realized the multi-generational effect of skiing in my life. I grew up not only with my skiing friends, but surrounded by their families as well, and skiing runs deep in this crowd. My friend Amy’s dad still runs the timing for every race the Franconia Ski Club hosts. The new warming hut at the base of the Mittersill slopes at Cannon, where we grew up skiing together, is named for her mom, who volunteered countless hours over many decades to skiing and young skiers. Likewise, Becky’s dad works as race administrator for FSC, and her mom races on the same team I do in the local innkeepers’ league. My own parents met on the mountain where my family still skis – three generations of us. My dad, at a spry 81 years old, has a 40-year PSIA (Professional Ski Instructors of America) pin and still teaches ski lessons. My mom skis multiple times each week, sneaking in runs with the grandkids when she can. The second and third generations of this crew gathered last Saturday night for dinner. The kids ran around the house, playing and giggling. The grownups hung around the kitchen sipping beers and talking – mostly about skiing. It was like déjà vu from 30 years ago. A few days earlier, my kids had hosted sleepovers for a couple of their own skiing buddies. It didn’t seem to matter that they were spending every day of school vacation together, from early morning straight through afternoon, these kids were trying to pack in as much time together as possible. It’s like they’re making up for the days lost between ski weekends. I know from years of experience that ski season ends, and ski buddies scatter, if only temporarily, back to their non-ski-season circles and activities. But we’re already talking about getting together during those no-skiing months – I and my ski friends, and my kids and theirs – about trips to the beach and hikes in the mountains. Whenever it ends, ski season will come again. There will be more chairlift rides, more dinners for gathering, more laughing and playing and talking together. Ski seasons come and go, but ski buddies are forever. Original content by Meghan McCarthy McPhaul, posted to her blog, Writings From a Full Life. This essay also appears as Meghan's Close to Home column in the March 10, 2017 issue of the Littleton Record.